Focus: “Why do doctors of the Middle East, North Africa and Eastern Europe migrate to Europe?” by Prof. Ahmed Driouchi, Professor at the El-Akhawen University, Morocco. Focus: “The End of the Arab Exceptionalism” By Dr. Ahmed Galal, President of FEMISE and Managing Director of ERF. Focus: “Young people, the key to the Mediterranean“ by Dr. Yusuf Kocoglu, Assistant Professor at the Laboratory for Applied Economics for Development (LEAD), at the University of Sud Toulon-Var. Focus: “Productivity and Liberalization in South Mediterranean Countries” by Dr. Raed Safadi, Deputy Director of the Trade and Agricultural Directorate of the OECD. Focus: “The Economics of the Arab Spring in an Era of Hope: The Cases of Egypt and Tunisia” by FEMISE. Focus: “Countries in the south of the Mediterranean are on the right track” by Otaviano Canuto, Vice-President of the World Bank and Head of the Poverty Reduction and Economic Management (PREM) Network. Focus: “MP and the crisis: from the loss of growth to the convergence” By Prof. Jean-Louis Reiffers, President of the Scientific Committee of FEMISE and the Institut de la Mediterranee. The FEMISE newsletter “Inside FEMISE” is an e-bulletin that is produced three-times a year. 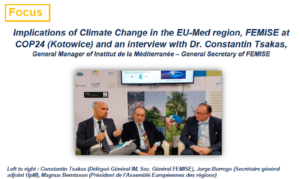 It aims to connect with the wider possible contacts of researchers and policy makes with updates on the most recent research outputs and policy recommendations undertaken by the FEMISE network on issues of importance to the the Euromed region. It also includes news and information about the recent activities of the association and its members, as well as articles and summaries of the most recent research produced and conferences organized by FEMISE. The e-newsletter is made simple, in a non-technical and concise manner as a mean to inform experts, policy makers and the general public.